Manti Te'o #5 of the Notre Dame Fighting Irish warms up prior to playing against the Alabama Crimson Tide in the 2013 Discover BCS National Championship game at Sun Life Stadium on January 7, 2013 in Miami Gardens, Florida. Manti Te'o, the All-American Notre Dame linebacker whose notoriety shifted from athletic achievements in the face of tragedy to the drama surrounding a fictional girlfriend, will begin his NFL career in Southern California. The 22-year-old was drafted Friday by the San Diego Chargers. He was chosen sixth in the second round, drawing a loud roar from the fans at Radio City Music Hall. Once thought to be a top NFL prospect, sports pundits questioned his draft prospects after it was revealed his girlfriend Lennay Kekua -- who he claimed died of cancer -- was nothing more than an elaborate online hoax. 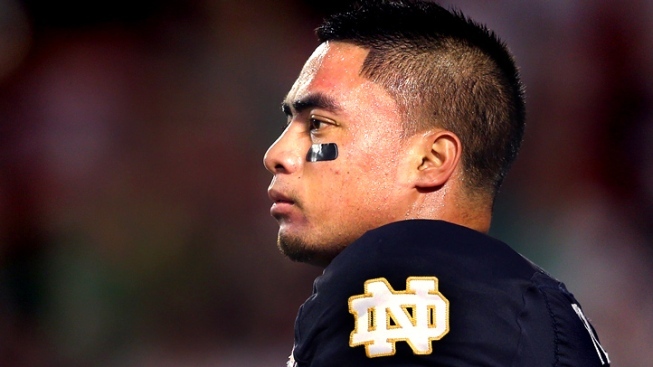 Even after Te'o learned he'd been duped, he continued lying about Kekua. "Now I get a phone call on Dec. 6, saying that she's alive and then I'm going be put on national TV two days later. And to ask me about the same question. You know, what would you do?" Te'o said in a high-profile interview with Katie Couric.